Sammy Nettling prepares for her at-bat. The senior catcher will play her final home series this weekend against Iowa. 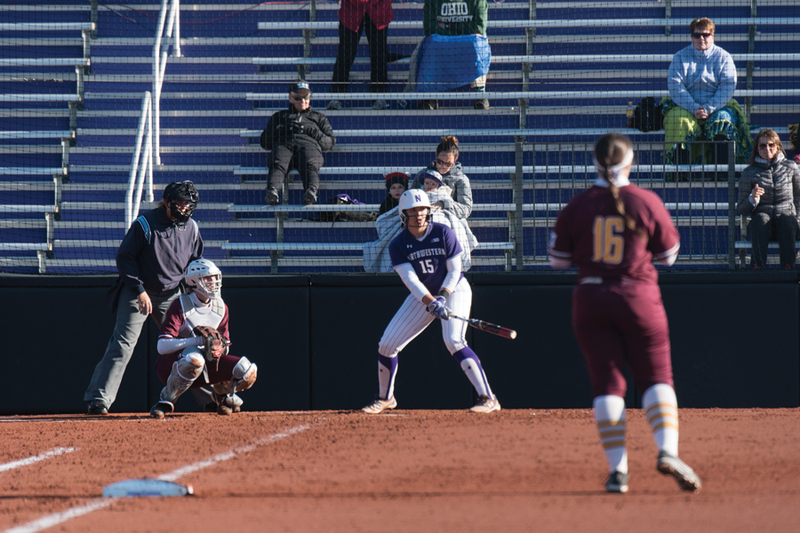 Northwestern will carry an eight-game winning streak into its final home series of the season this weekend, when the Wildcats host Iowa for three games. NU (30-13, 11-5 Big Ten) is playing its best softball of the year right now, having won 21 of its last 26 games. The Cats’ offense is the biggest reason for the team’s surge. NU scored just 4 runs in its victory over Loyola on Wednesday, but had scored at least 8 in each of its previous seven games. The Hawkeyes (19-26, 5-11), however, might be the perfect team to slow down the Cats. Despite Iowa’s mediocre record, the Hawkeyes’ ERA ranks third in the Big Ten at 2.18. Allison Doocy leads Iowa’s pitching staff with a 1.74 mark, and Lauren Shaw, despite her 3-11 record, has an ERA of just 2.80. Where the Hawkeyes have struggled is at the plate. Iowa has lost nine straight and averaged barely 2 runs per game during that stretch. The Hawkeyes are batting just .229 as a team and have only one player hitting above .300. Thus, this series could serve as an opportunity for NU to get its inconsistent pitching staff back on track. Freshman Kenna Wilkey has been a workhorse lately, having pitched in 10 consecutive games prior to Wednesday. She has been solid during that stretch, giving sophomore Morgan Newport and senior Nicole Bond time to put in work and overcome their struggles. Newport took a big step in the right direction with her performance Wednesday. She went the distance, allowing just three hits and one unearned run, while striking out seven. NU has won its last four series against Iowa, including taking two of three in Iowa City last year. Even so, Drohan said she expects a tough, back-and-forth series. The Hawkeyes beat a ranked Arizona State team in nonconference action and handed No. 15 Michigan its only Big Ten loss of the season. On Sunday, the Cats will honor their seven seniors as they play their final regular-season game at Sharon J. Drysdale Field. Four starting position players are seniors, including center fielder Sabrina Rabin, who has been named to an all-Big Ten team each of her first three seasons and was the 2015 Big Ten Freshman of the Year.